This post is sponsored by Amara, Burlap Fabric, COLORSHOT, Dremel and HomeRight. All opinions are my own. Today I’m sharing the Tablescape portion of my series of Fall Kitchen Reveal posts. Last week I shared the Fall Serving Area, which you can see HERE. We are FINALLY getting some Fall temps here in St. Louis and it is making me want to light my new Caramel Corn candle, snuggle under my oversized chunky knit throw and flip through some fall magazines. 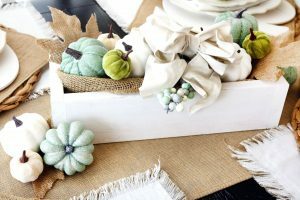 I am excited to reveal the Fall Decorated Tablescape in our new kitchen. Amara – All of the stoneware tableware is from Amara’s Luis Stoneware line, which you’ll also see pictured in my Fall Serving Area post. Burlap Fabric – Burlap Fabric sent me their Juco Table Runner with Cotton Ruffle and 14″ x 14″ Small Table Pads (12 Pack). 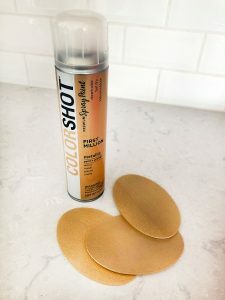 COLORSHOT Premium Spray Paint – COLORSHOT sent me a can of their spray paint in the First Million Metallic color. I sprayed the place cards with this color before using the Stylo+ Tool to personalize them. I found out about COLORSHOT at Haven. 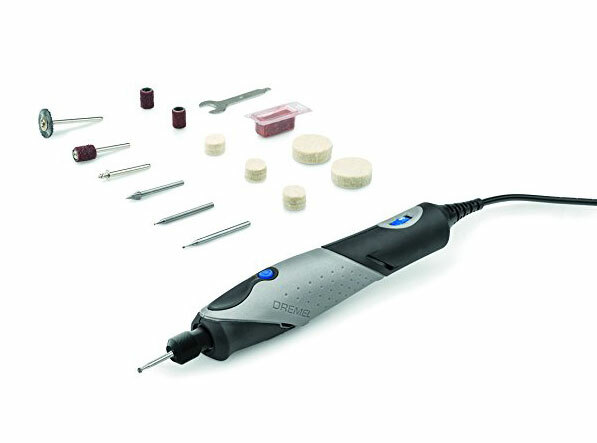 Dremel – Dremel sent me their Stylo+ Tool, which I used when I went to the conference at Haven. I used it to personalize the name plates on the table. HomeRight – HomeRight sent me their Super Finish Max Paint Sprayer and Small Spray Shelter, which I used for the White Pumpkin Chargers. I became familiar with HomeRight at the Haven conference. 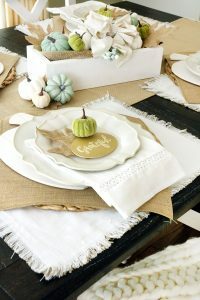 When brainstorming on how I wanted this tablescape to look, I knew I wanted it to tie in with the farmhouse style of our kitchen with neutral colors, lots of pumpkins and I wanted the name plates to have a pop of gold (my favorite color!). We purchased a table to match our new kitchen and went with the Carriage House Dining Table. Our table sits 4 everyday and when we are hosting there is a leaf we can add and it expands to sit 6. There are two styles of chairs for it, a Ladder-Back and an X-Back chair. I love that we can mix and match these chairs and it gives the table a little more visual interest. I found the perfect rug that we’ll be placing underneath the kitchen table, but I’m still waiting for it to arrive (it’s so popular that it was on backorder!). I will have it before my October Fall Kitchen Reveal post, though! The rug I selected is the Venezia VNZ-2309 from Boutique Rugs and I snagged 45% off it during a Labor Day sale. I still need to find a few smaller area rugs. For the name plates for each place setting, I used Dremel’s Stylo+ Tool to engrave a Fall phrase into each oval shaped piece of wood. I love the personalized feel that the etching gives to each name plate. 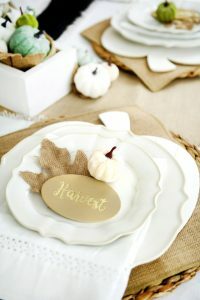 Each guest can take their name plate home and easily display it in their own Fall decor. You can spray paint the tags in any color (to match your decor or tablescape) or leave the wood unfinished. I suggest spray painting it before etching it with the Stylo+ Tool, that way the natural wood color shows in your wooden phrase and contrasts against the paint color. I used COLORSHOT Premium Spray Paint in their First Million Metallic color to spray paint the oval circles. 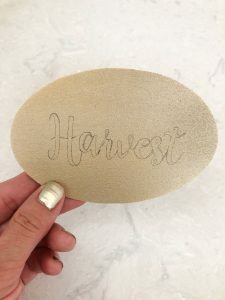 I used my Silhouette cutting machine to print out the Fall phrases (you could also use a stencil) and then traced around the lettering with a pencil. I used Dremel’s Stylo+ Tool to trace around each letter and fill it in. I wanted to share a photo of me using Dremel’s Stylo+ Tool, but I was home alone when I did them. I can’t wait to think up other DIY projects that I can do with this tool. It really is a must-have item for any DIY’er! Here is how a couple of the name plates and place settings turned out. I used the words Family, Grateful, Harvest and Thankful. I placed a burlap leaf under each name plate and a velvet pumpkin on top. 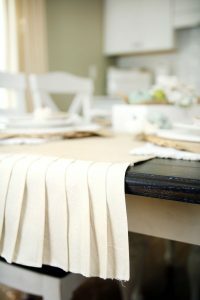 For a table runner, I used the Juco Table Runner with Cotton Ruffle from Burlap Fabric. 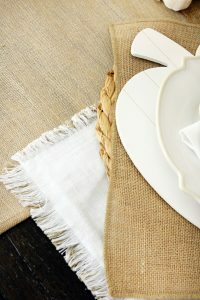 What drew me to this table runner was the burlap and cotton mixed with ruffles. 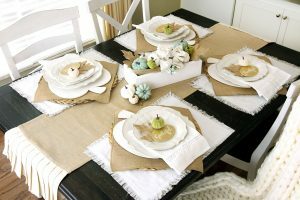 Burlap Fabric also sent me 14″ x 14″ Small Table Pads (12 Pack) that I layered under the white pumpkin chargers. 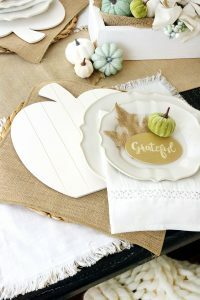 I love the added texture that the burlap table pads add under the wooden pumpkin chargers. Burlap Fabric is offering $5 off a $5+ purchase at burlapfabric.com with the code 5OFFCCMOM2018. The wooden pumpkin chargers are Unfinished Wood Slat Pumpkins that I found on Amazon. 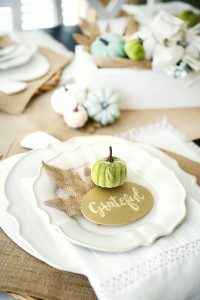 These inspired me for how I wanted the place settings to look for the Fall Tablescape. The Unfinished Wood Slat Pumpkins were unfinished, so I used my handy dandy Super Finish Max Paint Sprayer and Small Spray Shelter to quickly spray these white. I was amazed at how easy it was to use the paint sprayer and it gives such an even coating. I didn’t need to do a second coat on them! The spray shelter can be anchored down (it was slightly breezy the day I used it), so that it doesn’t blow away with tent stakes. 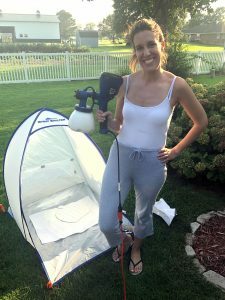 I can’t wait to use my Super Finish Max Paint Sprayer and Small Spray Shelter sent to me by HomeRight on future DIY projects, especially now that I know how easy they are to use! When coming up with the design of the Fall tablescape, I knew I wanted a low centerpiece. 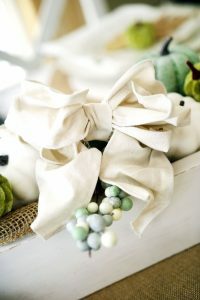 This centerpiece also works well for everyday, when we don’t have the table all glamoured up for hosting. You can find the planter box DIY, my husband made it for me a few years ago. I filled the bottom of the planter box with some white paper towels, then layered some burlap on top, then filled it with a neutral pumpkin filler. I also added some velvet pumpkins (for some variance in texture) and burlap leaves. I included some pumpkins (and a burlap leaf) on the outer two edges. This drop cloth bow I made up just for the planter box. I love drop cloth ribbon with wired edges, I always keep a couple rolls of it in my craft area. It makes the perfect neutral bow. I hope you enjoyed my second kitchen reveal post! Next month (October) I will be sharing a Fall Kitchen Reveal post. I am waiting on a rug for under the table and I also want to find some curtains. I’ll share more of the overall kitchen space through photos and how I decorated it for the Fall. I can’t wait! Be sure to check out Amara, Burlap Fabric, COLORSHOT, Dremel and HomeRight for your Fall Decorating needs!